The resolution to raise ten troops of Wiltshire Yeomanry Cavalry was taken in the Bear Inn in Devizes in 1794 . This followed an impassioned speech by Pitt the Younger suggesting such a measure would be advantageous in ensuring adequate troops to see off the French should they invade. In fact so promptly did the gentlemen of Wiltshire respond to Pitt’s suggestion that the Wiltshire Yeomanry Cavalry was placed first in the order of precedence of all the yeomanry regiments in the British Army. (Hence its motto “Primus in Armis”). The Wiltshire Yeomanry were called out numerous times to quell riots, including a bread riot in Devizes as early as 1795. Indeed so successful was the Wiltshire Yeomanry in suppressing these that the title ‘Royal’ was bestowed on it in 1831. A further honour came in 1863 when the Marlborough troop accompanied the Prince of Wales on the occasion of his visit to the Savernake Forest and were granted permission to add “The Prince of Wales’ Own” to its title. 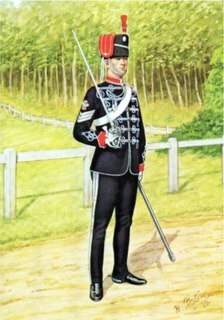 The intention in forming Yeomanry Units was to use them primarily for internal security, not overseas service, and therefore the regiment took no part in the Crimea War. However, the War Ministry came under such immense pressure to provide additional cavalry during the Boer War that the Government decided to form an Imperial Yeomanry. Officers and men of the Wiltshire Yeomanry constituted a large part of the 1st Imperial Yeomanry which served with such distinction that the regimental guidon bears the words 'South Africa 1900-01.' The regiment also served in France in the Great War and took part in many of the great battles including Ypres, Passchendaele, the Somme and Messines. The regiment was incorporated in the Royal Armoured Corps in 1941 and reformed in the TA in 1947. In 1994, 200 years after it was founded, the Prince of Wales’ Own Royal Wiltshire Yeomanry was awarded the Freedom of Devizes. Currently two squadrons remain, ‘A’ Squadron in the Royal Yeomanry and ‘B’ Squadron as the Royal Wiltshire Yeomanry Squadron within the Royal Wessex Yeomanry.